The Leavenworth Junior Nordic Team from Torin Koos’s hometown shows their support for their local Olympic athlete. Today he competes in the Men’s Individual Sprint in Vancouver. “Go Torin,” indeed! This entry was posted in Torin Koos and tagged athlete, Torin Koos by Lynsey. Bookmark the permalink. 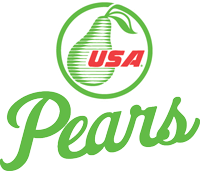 I work with USA Pear marketing offices that work in 38 countries all over the world: from Latin America to the Middle East, from Europe to Southeast Asia and places in between, our representatives serve markets on every continent except Antarctica. I love the opportunity to practice my Spanish and pick up new phrases in other languages (even if it’s just the basics of “hello,” “goodbye,” “thank you” and of course “pear”: pera, birne, гру́ша [GROO-sha], and more to come). I’ll be sharing highlights of the exciting and interesting activities that are taking place to promote USA Pears around the world. My favorite pear variety is Comice. Yum!